This article is about the item that freezes enemies and/or the environment. For other types of Timers, see Timer. Stop Watches (alternatively formatted Stopwatches and also known as Time Stops) are clock-like items that usually slow down or stop time when collected. If Mario and his friends first pull up four large vegetables in Super Mario Bros. 2, pulling up what would be a fifth one will instead reveal a Stop Watch. It will appear for a second and then freeze everything in the level for a few seconds. This gives a window of opportunity for Mario and his friends to avoid or defeat enemies and collect small hearts. However, touching the frozen enemies still hurts the player. Super Paper Mario Description A wacky watch that stops enemies in their tracks. The Stop Watch later appears as an item in Paper Mario. When Mario or his partners use it, it will immobilize enemies for a few turns (assuming it is successful). It can be bought at most stores and is a fairly common item. In a hidden block in the first scene of the Ultra Boots area in Toad Town Tunnels. On top of a Brick Block one screen south of the next-to-last part of the main road of Dry Dry Desert. Behind a bush in the back of the shore where Whale resides. In a hidden block before the stairs where Mario fights Monstar in Shiver Snowfield. On sale at Boo's Shop (25 coins) and the Star Haven Shop (15 coins). It reappears in Paper Mario: The Thousand-Year Door as the Stopwatch. Here, it is a somewhat rare item, for it can only be purchased in Twilight Town or Fahr Outpost. The item will immobilize enemies, just as in the game's predecessor. However, enemies can also use the item against Mario or his partners. Several warped clocks appearing in various colors will appear on-screen after using the item. After about four seconds, the item takes effect and immobilizes its prey. In a rock on the Moon surface near where Mario lands. Behind near the entrance in the first part of descending stairs in the Palace of Shadow. On sale at Twilight Shop (30 coins) and Northwinds Mart (12 coins), and Charlieton (24 coins). Dropped by ordinary Magikoopas, Moon Clefts, Bob-ombs, Bulky Bob-ombs, Bob-ulks, Wizzerds, Dark Wizzerds, Elite Wizzerds, X-Nauts, X-Naut PhDs, Elite X-Nauts, as well as the Dull Bones, Bob-ombs, and all the Fuzzies in Glitz Pit. The Stop Watch also appears as an uncommon item in Super Paper Mario, where it immobilizes all enemies. Six related items known as Watches or Clocks appear in Donkey Kong Land III. Watches, however, cannot be used during gameplay. They are obtained by completing the Memory minigame in each world, where Bear gives them to the player. They act primarily as collectibles which count toward a final game score of 100%, but also act to unlock various time trial challenges after King K. Rool is defeated for the second and final time. These time trials are merely select levels from the game which are timed, unlike in regular gameplay. Finishing six of the twelve total challenges, on top of collecting all major items in the regular levels, will lead to a perfect game score. In the Nintendo Comics System story Cloud Nine, it appears as an animate object who acts as the Mushroom King's alarm clock, dodging the grumpy King's attempts to swat him and fearfully running to Princess Toadstool for safety. The Stop Watch appears again in Mario & Luigi: Dream Team as a badge effect that occurs when mixing the Miracle Badge with the Gold Badge. 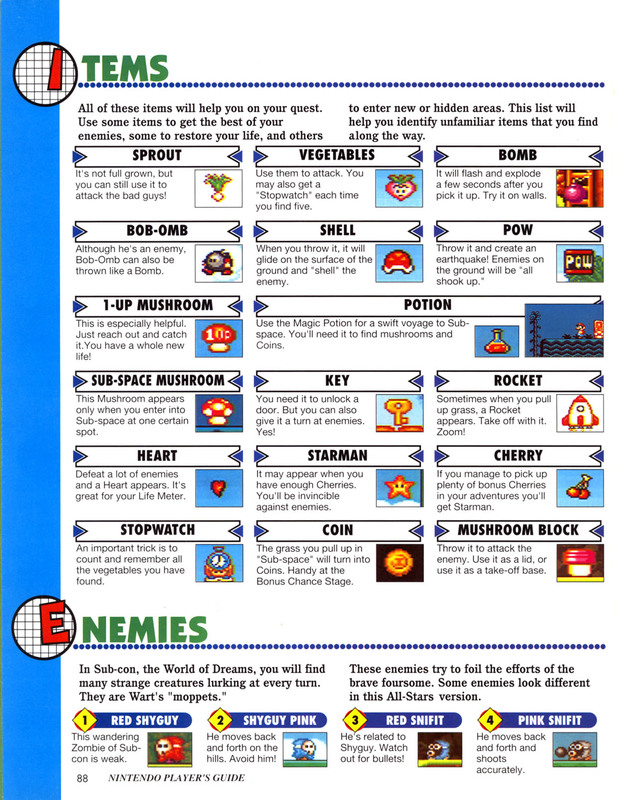 ↑ Super Mario All-Stars instruction booklet, page 21. ↑ Nintendo Power Volume 1, page 10. ↑ Super Mario All-Stars Player's Guide. Page 88. ↑ Super Mario Advance instruction booklet, page 29. ↑ Floogal (December 23, 2006). Paper Mario Stat/Attack Guide. GameFAQs. Retrieved October 17, 2016. ↑ Jdaster64 (April 7, 2016). Paper Mario: The Thousand-Year Door Enemy Item/Badge Drop FAQ. GameFAQs. Retrieved October 11, 2016. ↑ Donkey Kong Land III instruction booklet, page 5. ↑ Yume Kōjō: Doki Doki Panic instruction booklet, page 27. This page was last edited on March 8, 2019, at 08:25.